How to create export invoices in GST? - How can we help? In your Dashboard, go to Invoices and click on the +New button and select Tax Invoice. 2. Country of supply - will be selected automatically as the country of your client, but can be modified if you are shipping the goods in a different country. Export with IGST– Any exporter, Embassy or other agencies/bodies who supply goods or services (or both), paying IGST, can claim a refund for the IGST paid on the supplied goods or services. SEZ with IGST - Because the supply of goods or services to SEZ is considered as zero-rated supply, no IGST will be paid. You need to enter GSTIN of the receiver, country of supply will be India and the currency will be INR. 4. Export currency - here you need to select the currency of your invoice. It will be taken automatically as the official currency of the client's country. 5. Conversion rate - this is the conversion rate between your default currency (in the case of a company registered in India, INR) and the currency of the invoice. This amount is manually introduced by you,. 7. Add shipping charges, if any and the respective GST rate - if that's the case. Port code - search the name of your port or code and select from the dropdown. If you need to add other details such as Cess, Discount or Transport Labels, please select these options from the Invoice edit screen. For the purpose of this demonstration, we have left these out. Add any other extra details in the Terms section and then click on "Preview & Save". Your export tax invoice is now done. 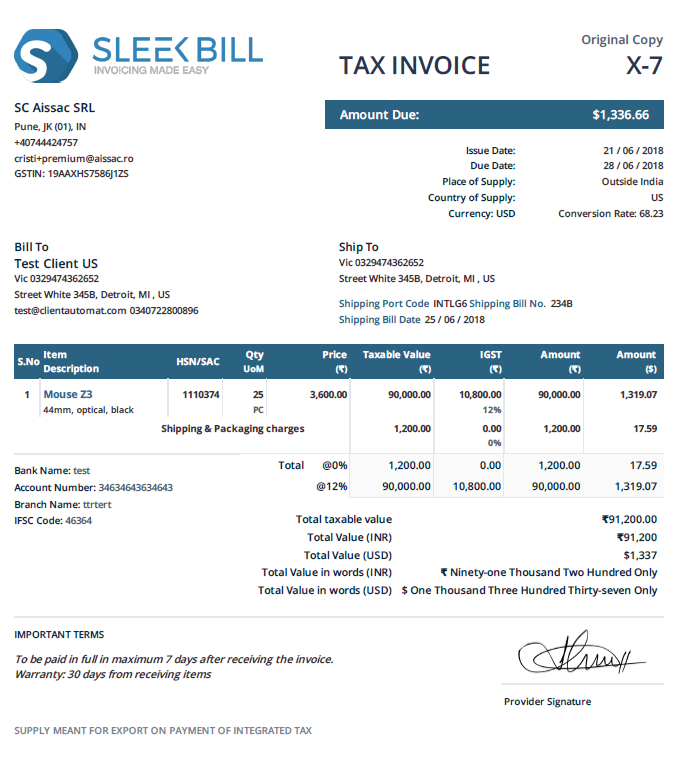 You can send it to your client straight from Sleek Bill, save it as a PDF, print it or add payments to it.